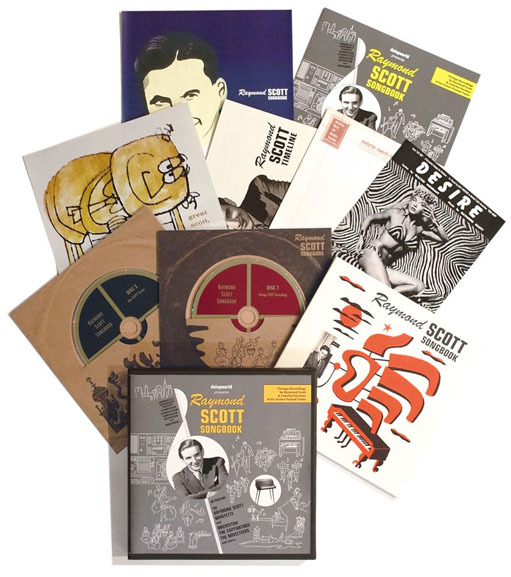 Our respected friends at Daisyworld Japan recently released a limited run of "The Raymond Scott Songbook". The deluxe box set comes with a 100-page book packed with photos & info, replica reprints of classic sheet music, posters, and ephemera, and is packaged in a retro-inspired Capitol Records 45 box. DISC ONE: includes previously unreleased vintage recordings of • 30's Quintette era, • 40's Orchestra era, • 50's Jingle Workshop era and early Scott recordings before he formed his Quintette. The box is only sold via their own website and Amazon Japan. I got a HIGH when it came to my mailbox. A DREAMY album! Art, songs, paper, aMAZing!!! Best Raymond thing is years. Yes - I received my very own copy just yesterday, as a complimentary gift from DaisyWorld - it's really, really nicely done. I had read good things about it, and seen the pictures that were impressive already. But holding it in your hands and real life unpacking - awesome stuff! Klinkt goed die nieuwe Metroesquivelpole Orchestra! Het doet mij denken aan vroeger: je had toen van die plaatjes met de vraag: Zoek de zeven verschillen... Dit plaatje is wat dat betreft niet gemakkelijk, maar wel erg leuk natuurlijk! hai Ruud - ja is heel goed gelukt dat plaatje :). Zal ik je een exemplaar ter review sturen voor PlatoMania? Utterly wonderful - the production design in spot on, the sound is great. It's like Christmas morning when you get it.